The Churchill Bust story is one of those weird inside politics bits that only junkies and people who follow the news professionally (or, at least semi-professionally) are really aware of. 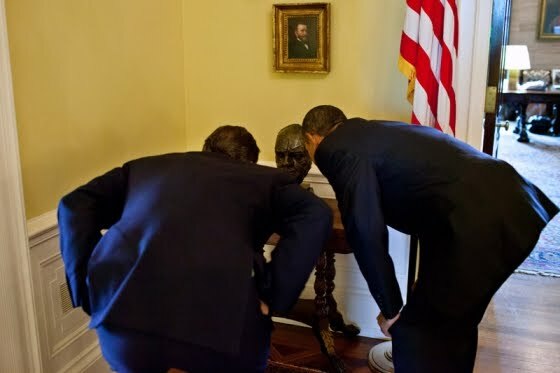 Most people probably didn't even know there was one bust of Churchill in the White House, let alone that President Obama sent it back to the British. So this story showed up again, for some reason, and the White House blog claimed it was all right wing hysteria, showing a picture of a Churchill bust in the White House from a few months ago. See, they said, its still there! Stupid reich-wingers. Normally, we wouldn’t address a rumor that’s so patently false, but just this morning the Washington Post’s Charles Krauthammer repeated this ridiculous claim in his column . . . This is 100% false. The bust [is] still in the White House. In the Residence. Outside the Treaty Room. Now its been shown that the story was true, and Obama did send a bust back to the British (its now at the British Ambassador's house), but that there were two busts. One was loaned to president Bush when he took office, and the loan extended to 2009. The British no doubt would have been glad to extend the loan to the new President, but he's been... less than friendly toward the British and particularly dislikes Winston Churchill, so there you go. The other one has been in the White House since the 60s, and is still there. So the White House blog was technically correct that a bust is by the treaty room... but lying when they said President Obama had not sent back a bust. I say "lying" on purpose, because it was in the news, only happened a few years ago, and the White House blog is written by staffers in the White House who would know damn well what happened. I am willing to admit that there is a chance that the person who wrote this is just that ignorant and didn't know, however. I got some facts wrong, because I made the mistake of relying on a White House blog post by the communications director Dan Pfeiffer, which included what looked like photographic proof that the bust never left the White House. Except Mr. Pfeiffer didn’t tell the whole truth and nothing but. Now, there's no apology for calling Charles Krauthammer a liar here, and there's no real admission of doing anything wrong. Just a "oops I didn't get it right, lets move on." But consider: this is a journalist, a reporter whose job is to find facts and dig into information. He basically took a White House press report on the topic, repeated it, and then went out to get some lunch. Now, I'm willing to put up with a certain amount of bias, because its impossible to avoid. What I'm not willing to put up with is this kind of uncritical sloth, being so lazy and credulous that you'll just believe what you're told without question because you like the source. This is simply inexcusable, particularly in an editor in the one of the world's leading newspapers. And it happens far too often. OVer and over I've read and heard from reporters and retired journalists about how news organizations will just take a press release from an organization they like or trust (or, at least has a snazzy logo on its fax and contains something they want to be true) and run it almost without editing as a news story. That's unacceptable from any news organization, but to do so with a politician is simply treason. News organizations are the natural enemy of politicians. Politicians are their prey, their targets. It is the job and should be the glee of any reporter to eviscerate and expose politicians. They should never, ever just take a political organization at its word, on anything, no matter what. But the election is at stake, and the truth is, the press has realized several things that they hate. 1) They are losing customers and dying. As they die, they thrash around frantically trying to get readers. 2) They aren't in control of a monopoly on information any longer. Talk radio, blogs, cable news, and the new media have blown that to pieces. 3) This country tends toward the right. Its not conservative, but the US is more right than left, and unless continually, relentlessly pushed to the left by popular media and the news, voters tend to elect more right-leaning politicians. The first two mean that the third part is less effective. They cannot any longer report on bad news about Democrats and control the damage or the story. It gets completely out of their control (Bill Clinton's dalliances with an intern, for example). So they are more and more in the tank every year for their chosen political allies to the point that as reporters they've not just abandoned all pretense of objectivity, but are betraying everything their job and calling stands for. They cannot be relied on to even try to look into issues when there's something political at stake, for fear of losing control of the story. This story was about Romney being a colossal dunce in England, that was the narrative and that's how they wanted this spun. See, he can't lead America, he embarrasses us in England! What a loser, don't vote for him! When it started to turn into "uh, are you kidding, look at how Obama has been acting toward England for the last four years?" the White House lashed out and the press, eager to keep the story on target and not report anything bad on Obama, went along like obedient little sheep. And again they end up looking idiotic. Because that's what happens when you abandon all integrity and honor for political success. You lose any credibility. And while you'd think a dying industry would be more careful with what shreds of public trust they still have, they have simply gone berserk over those last two points. Loss of monopoly and inability to control the narrative to keep their side in power. See, when you honestly and genuinely think, having been raised and carefully indoctrinated to believe this - that Republicans are poor-hating racist monsters and Conservatives are Nazis in sheep's clothing who want to outlaw fun and beat women with truncheons for asking a question, the cause is too great to back off of, even for your career. The evil right must be stopped, at all costs, no matter what. Its why Hollywood puts out utter bombs over and over again, socialist crap that nobody wants to watch. They are capitalists who put out deliberately low-earning trash because the right is just that bad and must be stopped. And again, to me that's terribly sad because we need that fourth estate. We need information, we need the news, we need reporters who'll dig into corruption and misuse of power, waste, fraud, and scandal. A democracy cannot survive if the public has no reliable source of information. I don't have the energy or resources to go get that information myself; I rely on news organizations. I wouldn't have much of a blog without them. Nobody would. We'd all be talking about our kids and how we mowed the lawn and that last song we listened to all day. Diverting once in a while, awful as a steady diet. We need New York Timeses and CNNs and Daily Telegraphs and so on, because that's where the information comes from. And that, my friends, is why I so often return to this topic. Not because I like to kick reporters when they're down or hate journalism. Because I like journalism and need reporters. But they're letting everyone down and failing us to the point of treachery by their idiotic need to protect political allies. And that's contemptible, and deserves steady and prominent mockery and assault. *UPDATE: Dan Pfieffer at the White House apologized to Krauthammer for calling him a liar. Sort of. The entire statement is in the passive sense "an apology is owed" but no actual apology is given.